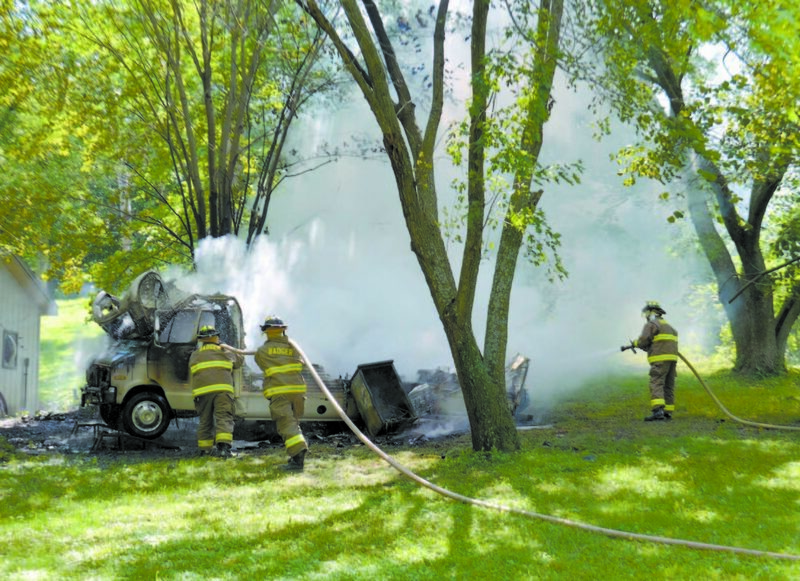 Messenger photo by Bill Shea Badger and Clare firefighters extinguish a blaze that destroyed a camper Saturday morning. The fire was reported at 10:33 a.m. at 2212 160th St. It ignited while a man was trying to start the vehicle, but he escaped unharmed. BADGER — Charlie Echevarria needs a new Veterans of Foreign Wars Honor Guard uniform. The uniform he was to wear to a funeral today, plus much of the clothing and computers belonging to the Fort Dodge man and his wife, were lost Saturday morning when the camper the items were in was destroyed by fire. The couple was in the process of moving to a new house and was keeping those things in the camper until the move was finished. “We came back today all happy and ready to move,” Echevarria said. The camper was parked at a friend’s house at 2212 160th St. Echevarria was trying to start the 1975 Dodge Holiday Rambler when it ignited. “I tried starting it and it almost started,” he said. He pressed the accelerator pedal to give the engine some gas, then turned the key again. The vehicle backfired, and a fire ignited behind the dashboard. He had left the cab door open, so he was able to get out of the camper quickly and unharmed. He tried to grab some items out of the back of the vehicle, but fast-spreading flames stopped him. The blaze was reported at 10:33 a.m. Firefighters from Badger and Clare used four hoselines to put out the fire. After it was out, a layer of soapy-looking foam was applied to the wreckage. Badger Fire Chief Jeff Brundige said the foam would seep down through the wreckage and douse hot spots more effectively than just water. The fire destroyed the camper and burned some grass around it. Firefighters were on scene for about an hour. Webster County sheriff’s deputies also responded. Echevaria said the camper was an “awesome ride” that his family took to places like Twin Lakes and Minnesota.